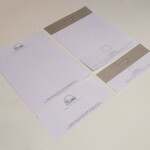 Letterheads and compliment slips say a lot about your business as one of the most forward facing elements in your print arsenal. That's why you need to have quality letterheads and comp slips that you can be proud of, don't settle for less than the best. 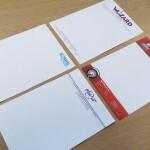 Here at Ace Print we have decades of experience designing and printing letterheads and compliment slips for all sorts of companies. We have a dedicated design team with years of experience that know how to created letterheads perfectly suited to your industry that will fully utilise your brand imagery and colours. 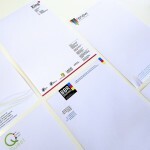 With our letterheads and comp slips you get options, it's not a simple one type fits all scenario. Typically we use 100gsm or 120gsm weight paper but you can go outside this if you have a specific weight in mind. 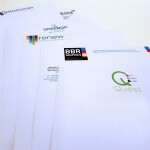 Though if you want to overprint our letterheads we would warn against going too thick as office based printers may struggle. We also usually use either satin or bond paper, dependant on the feel you want, but again we can go outside the realms of this if you have something specific in mind. Even the sizes can be altered if, for whatever reason, you don't want to use standard A4 or A5. Prices are for printing on 100g bond. For a more detailed quote please get in touch.